Did you know that the new prevalence rates for autism came out in March and indicate that 1 in every 50 children is on the autism spectrum. Yes, I said 1 in 50. As USA Today put it, that’s one on every school bus. It’s almost one in every classroom. This is only a year after the prevalence was raised to 1 in 88 in April of 2012 and is part of an ever increasing indication that autism is all around us. The new study that just came out actually points out that the increase is largely because of children not being diagnosed early enough to be caught in the earlier studies (which looked at 8 year olds). Higher functioning children are less likely to get an early diagnosis and many children go undiagnosed until adolescence. So, the chances that you will have a child in your classroom, if you don’t already, are pretty high. 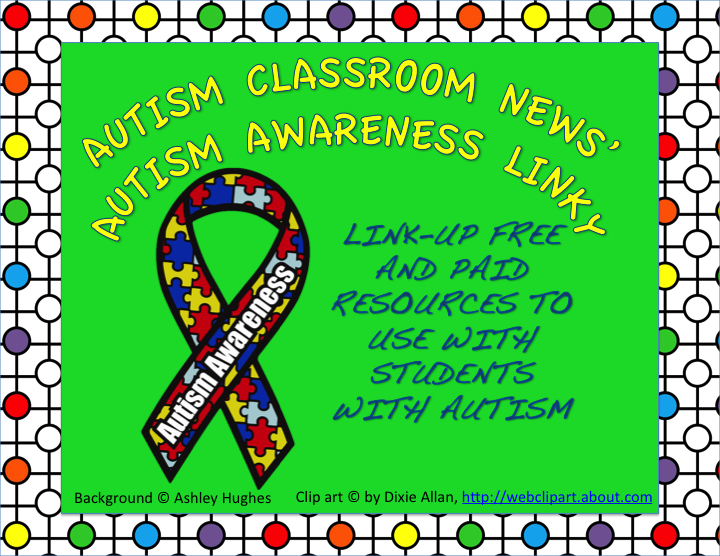 Welcome to April–Autism Awareness and Acceptance Month at Autism Classroom News. This is the time of the year when we try to raise awareness about autism and increasingly it’s become a time to push beyond awareness to acceptance. There are a variety of organizations doing a lot of different fund raising and awareness activities. 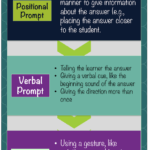 So, I have a few ideas in mind with the blog, Facebook and TPT to try to help support teachers of students with autism and to do my part in raising awareness. 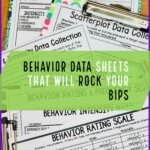 Since this blog focuses on autism specifically, some of the posts won’t be that different than usual. I have some guest posts lined up (starting with Lisa’s post from The Lower Elementary Cottage on this past Saturday). 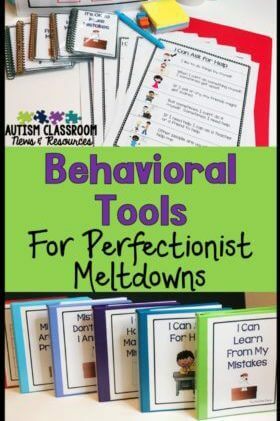 I am also going to be giving away freebies (new items) throughout this month through Facebook and the blog for products that are great for students with autism but also are quite effective with lots of other kids. 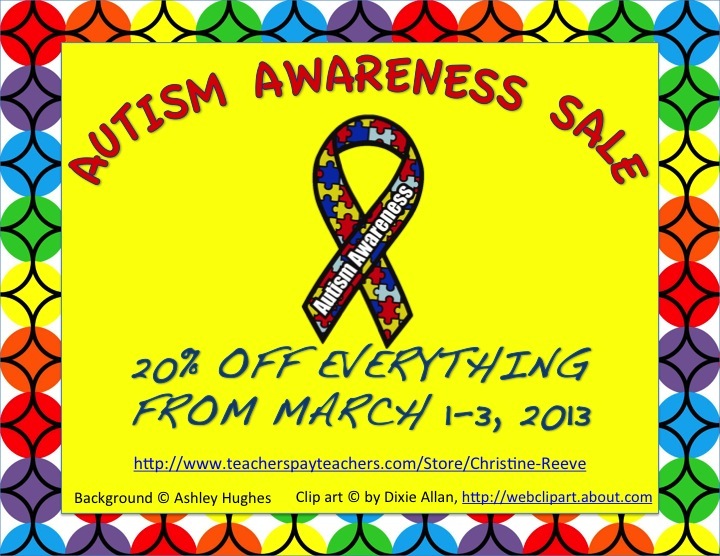 Also, everything in my Teachers Pay Teachers store is on sale from 4/1 through 4/3 at 20% off. There are a couple of free items available there and on my Facebook page for fans. I will be sending a freebie out to TPT followers in the next week as well. 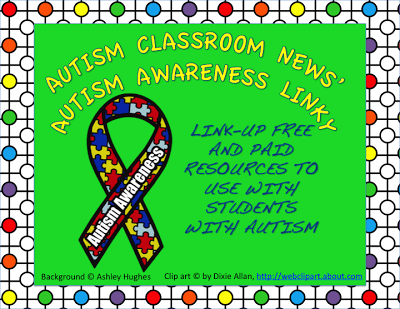 And finally, I am opening a linky to bloggers and the TPT community to post free and paid products the would be effective for students on the spectrum. My plan is for this linky to then become a permanent tab on the blog for teachers to refer to in the future when they encounter different children with autism. Because, as I will post in the next few days, Stephen Shore was definitely right when he said (and I paraphrase), If you’ve seen one person with autism, that’s what you have seen. One person with autism. The variety of presentations of this spectrum are mind boggling to me and I’ve met ALOT of individuals on the spectrum. So, if you are a blogger or a seller, please link up below (see the guidelines below). If you link up, please grab the button and publicize it on social networks and your blogs. If you are a teacher, follow the blog or my Facebook Fan Page for updates, freebies, and new information. You may also want to see the fabulous collaborative Pinterest Page for World Autism Awareness Day (April 2), check out the activities that the Autism Society suggests, and join the Light It Up Blue campaign from Autism Speaks. If you work in the autism community, share your plans for raising awareness in the comments! Whatever you do, let’s get the word out to help people understand and accept individuals with autism spectrum disorders! What a great linky! Im a new follower! Im thinking about putting up my LifeSkill bingo games?!? What do you think? Absolutely! Please do. Just started following your blog and I love the survival sign bingo. I"m so glad you did…thanks! I LOVE this link up. 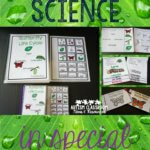 I added my newest adapted book that has been a hit. 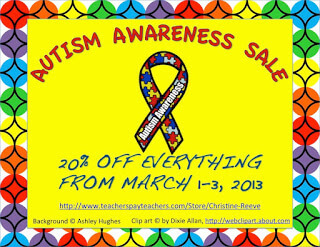 I am also making my whole store on TPT on sale for the rest of the month in honor of Autism Awareness. I thought it was the least I could do to help spread the awareness amongst educators. I'd love feedback on my products! I'm so glad we found each other and you linked up! I will check things out at your store…started following you there! Thanks! Thanks! Glad you linked up.